I have something to say, but I am unsure as to how I should feel about it. Should I be proud? Ashamed? A bit sheepish, maybe? Luckily, I think we're all friends here, and I can be honest with you. Here goes. We bought a deep fryer. There, I said it. It's out in the open. There's no turning back now. We've stepped up from a deep-sided pot on the stove, we're in the big leagues now. We've gone Pro. We have purchased an appliance, a unitasker at that, designed for the sole purpose of deep-frying food. Scandalous! What is it about the notion of a deep fryer that sends hands clutching for the proverbial pearls? I nary blink an eye at baking cake after cake, or cupcake or cookie, but speak of a deep fat thermometer and I feel as though my ladylike self should swoon at the thought. Instead, I am giddy. On Canada Day there were donuts. The day after, there were fries. Alas, even as I happily plunged the slivered fingerlings into the depths of the fryer, I could hear the imagined whispers of a hundred judgements. "Sure, she started with fries. But they were just a gateway." "Next thing you know there will be churros. Or maybe even beignets." "From there it is a slippery slope into the hard stuff. Corndogs." "Mark my words, shel'll be battering Twinkies within a month and buying bulk packs of chicken wings on the sly." "You know, I wouldn't put it past her." Not to worry, I can handle my deep-frying. I promise. So what if I get a bit of a thrill when I shake the chip basket? A little golden-fried perfection never hurt anyone. There are worse things I could do. Now if you will excuse me, I have to get back to my fryer. For the fries, prepare them how you like to - fat, thin, shoestring, chips, whatever (see below for links to recipes). Make enough for the size of your crowd or your appetite. This recipe is for about a standard quantity of fries for 4 people. Any leftover mayonnaise should be refrigerated immediately, and can be used as a sauce, a dip or sandwich spread. Prepare the mayonnaise first. In a bowl, stir together the first five ingredients. Taste, and adjust for seasoning with kosher salt and freshly-cracked black pepper to taste. If the sauce is to thick, thin with additional lemon juice or some warm water. Cover and refrigerate for at least 30 minutes to allow the flavours to mellow and blend. When the fries are hot and crisp, toss through with the minced garlic, dried red chili flakes (if using) and almost all of the parsley, reserving some for garnish. Season with kosher salt. Tumble the fries out onto a platter, with the mayonnaise alongside. Sprinkle with the reserved chopped parsley. 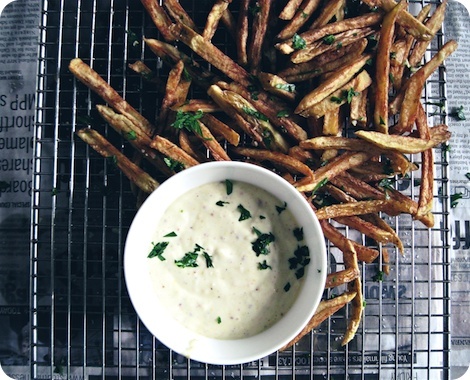 • Easier French Fries from Cook's Illustrated, cold oil fried (via their site, requires login). Sticky Crows likes this method, and has some step-by-step photos. • I used the Cook's Illustrated recipe for these, which use a technique also attributed to Joël Robuchon. You start your potatoes in cold oil, turn the heat to medium-high, then leave them be. Once they start turning golden, you stir the fries about a bit to prevent sticking, then cook until crisp. Details and specifics are available in through the links provided. I had feared that the fries would be greasy, poking at them suspiciously now and again, but they were surprisingly not so. According to the accompanying article, this method yields a result with less oil absorption than traditional double-fry methods. • Homemade mayonnaise is my preference, but if you are at all unsure on the freshness of your eggs, your favourite store-bought brand is more than fine. If using homemade, less lemon juice might be needed, depending on the recipe.